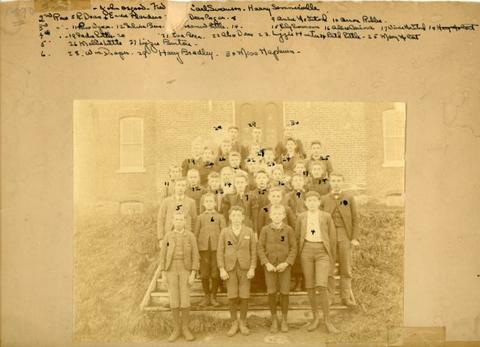 The photograph shows the students and teacher at the Waterville Academy in 1890. Among those pictured in the photograph are: John Osgood, Fred ?, Carl Swanson, Harry Sommerville, R. Dean, Ernie Flanders, ? Dean Penger, Anni McIntosh, Anson Rublee, Riss Wyman, Silvia Bean, Rosamund Little, Lily Swanson, Alice Cairnie, Winnie McIntosh, Sadie Little, Eva Bean, Alice Dean, Lizzie Hunter, Ruth Little, Mary McCourt, Mellie Little, Lizzie Burton, William Draper, Harry Bradley, and Miss Hepburn.